Coin Collecting Reviews – An Edward VI Gold Sovereign, Third period mm. Ostrich head, c1551. Obverse with Crowned figure of king Edward enthroned facing, holding orb and sceptre, portcullis at feet. Reverse with shield of arms at centre of full-blown rose (S.2446; N.1926; Schneider 701) 15.03gms. This handsome and exceedingly rare Edward VI Gold Sovereign coin was purchased by Jonathan Rashleigh at the famous E. J. Shepherd sale in 1885. 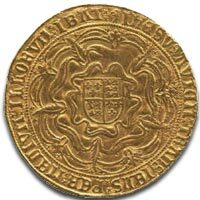 It is a full and well struck Edward VI Gold Sovereign, almost very fine, with clear portrait. It is believed that only six examples of its type are in private hands. Rev. E.J. Shepherd, Sotheby, 22 July 1885, lot 227, sold for £17 and 5/-. E. Rashleigh, Sotheby, 28 June 1909, lot 811. Dr. R.J. Cassel, Glendining, 3 December 1924, lot 269. A. Thellusson, Sotheby’s, 19 October 1931, lot 43. C. Corbally Browne, Sotheby’s, 25 March 1935, lot 252. Spink Numismatic Circular, September 1979. Spink 38, 1983, lot 6. ex Noble Numismatics 43, November 1993, lot 2688. 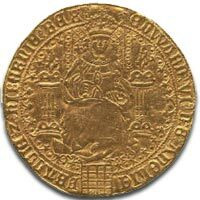 Auction Estimate May 2009 for this fine Edward VI Gold Sovereign, £20,000 to £25,000 (GBP). Edward VI became King of England and Ireland on 28 January 1547 and was crowned on 20 February at the age of nine. The son of Henry VIII and Jane Seymour, Edward was the third monarch of the Tudor dynasty and England’s first Protestant ruler. During Edwards reign, the realm was governed by a Regency Council, because he never reached maturity. And from 1550 to 1553 by John Dudley, 1st Earl of Warwick, who in 1551 became 1st Duke of Northumberland. Edward VI’s reign was marked by economic problems, military withdrawal from Scotland and Boulogne-sur-Mer, then social unrest that in 1549 erupted into riot and rebellion. It also saw the transformation of the Anglican Church into a recognisably Protestant body. Henry VIII had severed the link between the Church of England and Rome and during Edward’s reign, Protestantism was established for the first time in England, with reforms that included the abolition of clerical celibacy and the mass, with the imposition of compulsory services in English.